Thanks to the ongoing contributions of Lucas Rage there have been 9 additional figures added to Art 100’s 233 Counterfeit Collection. These 9 figures put the entire 233 Counterfeit Collection at 70% complete. 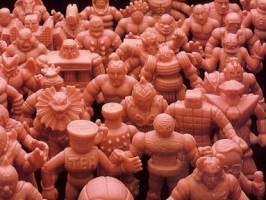 If you have any counterfeit figures that you would like added to the virtual “Counterfeit Collection,” then please send them to the University of M.U.S.C.L.E. with the figure’s poster number and a brief explanation of the physical quality and characteristics of the figure (i.e., flexible, rigid, etc.) similar to the descriptions in Art 100. This entry was posted on Thursday, January 20th, 2011 and is filed under Art, Research, UofM News. You can follow any responses to this entry through RSS 2.0. You can skip to the end and leave a response. Pinging is currently not allowed.